No figure in American public life has had such great expectations thrust upon him, or has responded so poorly. But Ted Kennedy -- the youngest of the Kennedy children and the son who felt the least pressure to satisfy his father's enormous ambitions -- would go on to live a life that no one could have predicted: dismissed as a spent force in politics by the time he reached middle age, Ted became the most powerful senator of the last half century and the nation's keeper of traditional liberalism. As Peter S. Canellos and his team of Boston Globe reporters show in this revealing and intimate biography, the gregarious, pudgy, and least academically successful of the Kennedy boys has witnessed greater tragedy and suffered greater pressure than any of his siblings. At the age of thirty-six, Ted Kennedy found himself the last brother, the champion of a generation's dreams and ambitions. He would be expected to give the nation the confidence to confront its problems and to build a fairer society at home and abroad. He quickly failed in spectacular fashion. Late one night in the summer of 1969, he left the scene of a fatal automobile accident on Chappaquiddick Island. The death there of a young woman from his brother's campaign would haunt and ultimately doom his presidential ambitions. Political rivals turned his all-too-human failings -- drinking, philandering, and divorce -- into a condemnation of his liberal politics. But as the presidency eluded his grasp, Kennedy was finally liberated from the expectations of others, free to become his own man. Once a symbol of youthful folly and nepotism, he transformed himself in his later years into a symbol of wisdom and perseverance. He built a deeply loving marriage with his second wife, Victoria Reggie. He embraced his role as the family patriarch. And as his health failed, he anointed the young and ambitious presidential candidate Barack Obama, whom many commentators compared to his brother Jack. The Kennedy brand of liberalism was rediscovered by a new generation of Americans. Perceptive and carefully reported, drawing heavily from candid interviews with the Kennedy family and inner circle, Last Lion captures magnificently the life and historic achievements of Ted Kennedy, as well as the personal redemption that he found. 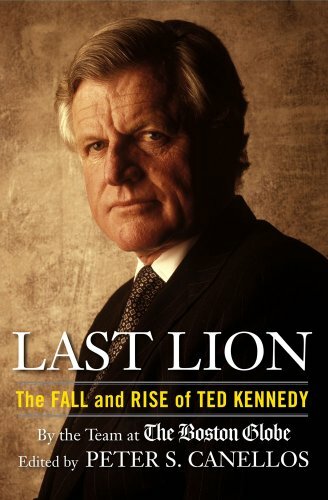 "a definitive look at Senator Kennedy's life"
Last Lion: The Fall and Rise of Ted Kennedy reaches its "definitive look" goal with a balance of stately respect for its subject and uncompromising disclosure of available information. This biography begins with the 2008 news of Edward Kennedy's diagnosed malignant glioma and then rewinds to his childhood, relating anecdotes about his clowning, good cheer, and bad spelling, among other things. The years in boarding schools, at Harvard, in military service, at Harvard again, and in law school receive their due. As a newly-minted lawyer, he worked on brother Jack's campaigns for the U.S. Senate and then the presidency. With John F. Kennedy in the White House, a not-yet-thirty Ted didn't get much help (at least overtly) from either JFK or the attorney general, Robert Kennedy, when he campaigned for a Senate seat. His first election victory in 1962 marked the beginning of an unbroken string of re-elections and forty-six years (and counting) in the most exclusive club in the world. LAST LION neither digs up new knowledge nor relies on new interviews. Instead, it modestly triumphs as a synthesis of already available but scattered mainly journalistic material. It engagingly and fluently covers both the personal and professional milestones of Senator Kennedy's life. Editor Canellos and the team of Boston Globe reporters who brought this material together don't avoid controversies and scandals such as the Harvard cheating episode and, of course, Chappaquiddick. In fact, the biography consigns about thirty-four pages to events surrounding the Mary Jo Kopechne death, including Kennedy's statement that, " 'I regard as indefensible the fact that I did not report the accident to police immediately.' " But this isn't a tabloid expose or a hack job; the facts are presented, but generally the steady tone of LAST LION is empathetic and admiring in a low-key manner. Ted Kennedy's personal life -- his marriage to Joan that ended in divorce, his years of returned bachelorhood and "dating," and then his marriage to attorney Vicki Reggie in 1992 -- also receives its due but isn't stressed out of proportion. Often mentioned -- and rightfully so -- is Kennedy's surrogate fatherhood to his many nieces and nephews. The children of John and Robert Kennedy needed someone to attend their first communions, their school and sports events, and he, they testify, was always there. As LAST LION notes, however, the children could not escape their own share of scandals and problems. This biography doesn't fixate on (or gloss over) the watershed assassinations of President Kennedy and Senator Robert Kennedy. In the long term, their deaths forever remain personal tragedies for the youngest brother, but they also put pressure on him to "finish" their legacies in the White House, leading to several attempts to secure the nomination before he resolved to remain a legislator. Many stories of Kennedy's kindnesses to fellow senators and his ability to reach across the aisle to get legislation passed are also a part of LAST LION, particularly in the last decades after Kennedy decided " '...the pursuit of the presidency is not my life. Public service is." In all, Kennedy has authored "roughly 2500 major bills." George Washington reportedly told Thomas Jefferson, " 'We pour our legislation in the Senatorial saucer to cool it.' " Kennedy has had other ideas. The book notes: "...Ted marshaled all the Senate protocols and courtesies to the service of a quietly aggressive political agenda." In the 2008 presidential election, Kennedy refused to endorse a Democrat for some time, but finally, to the dismay of many Hilary Clinton supporters, he rallied to Obama's side. And President Obama has said of him, " 'He is somebody who battled for voting rights and civil rights when I was a child. I stand on his shoulders.' "
Last Lion offers a definitive, comprehensive look at the Kennedy who means the most to me personally, Ted Kennedy. As a twenty-something, JFK and RFK were long dead by the time I was born. But Ted Kennedy was the liberal champion in the Senate and also the ultimate dealmaker, pragmatically working to pass legislation and never allowing the perfect to be the enemy of the good. The book fully explores what I view as Kennedy's three personalities: 1. His public political personality, where he is a hardworking liberal stalwart, a dealmaker, and a champion for the Democratic Party and his constituents; 2. His family personality as the patriarch of the Kennedys, serving as a surrogate father to the Kennedy children who lost their mothers and fathers; and 3. His personal personality, the hard drinking, womanizing, Chappaquiddick Kennedy. Each personality is dealt with in the book in an even and clear minded way. I'm sure Kennedybashers, who could never see any of his good, will think the book is a whitewash. But as a Kennedy fan, or at least a fan of his first two personalities, I felt the book was pretty tough on him in some spots. Two parts of the book were particularly interesting to me as a student of politics and history. First, the discussion of each potential Kennedy presidential run. The first was the calls in 1968 to pick up the torch of RFK. The next two were the chances in the 70s that Kennedy backed away from, perhaps due to family challenges and Chappaquiddick. The next was when Kennedy finally pulled the trigger in 1980 in a somewhat disastrous run whose highlight was his concession speech at the Democratic National Convention. 1984 seemed like it could have been the year, with everything in place for a triumphant run by the Kennedy staff. But again, Kennedy backed out and never again considered a campaign. The second particularly interesting section was on Kennedy's work for the 9/11 families, particularly those in Massachusetts. This was Kennedy, and political leaders in general, at their best. Kennedy provided services, offered support, and kept in touch without ever publicizing his efforts. I bought this book soon after reading an article in Politico in which Republican senators overwhelmingly cited Ted Kennedy as the most bipartisan and easiest senator to work with. I also realized that I knew more about Jack and Robert Kennedy, whose political careers ended tragically over 40 years ago, than I knew about this lion of the senate who has influenced politics so much during my lifetime. While I have read many biographies of the other Kennedys, I actually came to this book with few preconceived notions about Ted (other than the praise he received in that aforementioned Politico article). This book helped fill in the basic personal and political biography of Ted Kennedy the man. Some of the earlier history is familiar to Kennedy fans, but is retold following Ted Kennedy. The authors discuss some interesting campaign anecdotes, such as how Ted copied Jack's habit of taking a mid-afternoon bath. It gives a very good sense of life in the Kennedy family and Ted's role in it, both as the runt of the family and eventually the patriarch. Overall, I found the book a useful addition to my American political history library. However, as it is written by a team of journalists, the book focuses more on Kennedy's personal life than his politics and political ideas. While the authors point out a few incidents which shaped his philosophy (such as his reflections on healthcare when he was hospitalized after a plane crash in 1964), but these are often unsatisfactory. I would love to have learned more about the incidents and forces that shaped his political beliefs and why he has remained such an unabashed yet pragmatic liberal. When it focuses on Ted's political life, it highlights his glad-handling people skills that allowed him to thrive in the senate (which Bobby notably lacked). As such, this is not a serious treatment of Kennedy's political philosophy, but rather a study of Kennedy as a man and influential politician. As other reviewers have commented, this book is not unbiased. It portrays Ted Kennedy in a favorable light, although is not unduly fawning. The authors discuss his flaws and personal weaknesses, but also avoid stereotypes about the man. For example, while they spend quite a bit of time discussing Chappaquiddick, they do not address every single theory about the accident. Rather, they mostly describe the version of the accident that arose during the court case, as well as those that appeared in interviews at the time. For much of the incident, Kennedy's explanation seems plausible, but the authors also do point out inconsistencies in his testimony. It is difficult to say whether this is "bias" or simply journalistic caution in not straying too far from the known facts. I for one appreciate the authors' staying away from pure speculation.